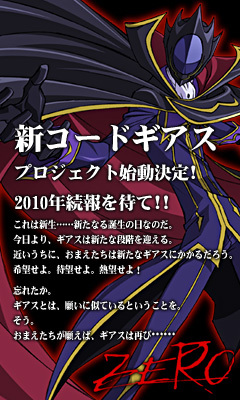 Sunrise announced at the event “Kiseki no Tanjoubi” that Code Geass will have a new project in 2010. The event was held this Saturday in Japan to celebrate the birthday of the character Lelouch. It is still not known whether it will be a new TV series, a movie or an OVA series, or even if CLAMP will be involved. More information should be announced in 2010. Stay tuned! New Code Geass project announced! Wait until 2010 for more information!! This is a reborn… It’s the day of a new birth. From today on, Geass shall reach a new level. In the near future, we will take you to a new Geass. You wished for this. You eagerly waited for this. You yearned for this! Geass is like a desire. Special thanks to syaoranmew for the translation! EDIT: for more information about the event, check out this report. It was originally translated from portuguese, by the way. XD Thanks, Yuuto-san! Well, pretty art is always welcome! But I honestly think the story is.. over. Not that I can’t imagine of a twist, but. Well, we’ll see. Kamui Santaaaa 😀 It never gets old! I just hope that they don’t deform the characters in any way… althoguh that is like an imposssible wish… But I am happy that Code Geass may be coming back for season 3. You mean CLAMP’s original designs were deformed? he meant the characters Alex as CHARAS, lol. people that watch Geass, do not focus MUCH on the designing, but rather in the story you know. They just can’t let the franchise die, huh? I hope its not a third series, I don’t think I could cope emotionally. Haha. An OAV/D, perhaps. This news actually doesn’t excite me. I still don’t know my feeling about the first two seasons. I will just wait for more info. to decide if I’m going to put in Plan to Watch list. I hope they won’t bring back Lelouch from death, or wherever he is. Movie or OVA is fine, but no season 3 please! So Code Geass is coming back? Cool. If it is a third series, then either Lelouch ain’t dead or I suspect we’re gonna get a few episodes in which he takes over Hell. And then invades Heaven to get Shirley back. I’m not sure if it’s official, but CLAMP is going to do Character design for this new proj.